George F. Warren, a pioneer and international leader in the emerging field of farm management during the first four decades of the twentieth century, and the namesake of Cornell University’s Warren Hall, is the fascinating subject of Professor Emeritus Bernard F. “Bud” Stanton’s biography, George F. Warren: Farm Economist. Among his many accomplishments, Warren is widely revered as a memorable teacher of agricultural economics to generations of students, farmers, business owners, and rural leaders in New York. His research and popular speeches influenced state legislation on conservation, land use, the structure of local governments, the improvement of highways, the building of regional markets, and the improvement of rural schools. He was an important advisor to Governor Franklin Roosevelt (1929–33) on rural development policy, and when FDR became President of the United States, Warren continued to serve as one of his key economic advisors. George F. Warren: Farm Economist tells the story of Warren’s formative years as a farm boy, student, and teacher in Nebraska, his move to Cornell University to study with Liberty Hyde Bailey, and his productive years as a Cornell professor. It tells of the surveys of orchards in Wayne and Orleans Counties which became his Ph.D. thesis, his developing interest in the business side of agriculture, the great success of his first book, The Elements of Agriculture, and his key roles in the development of farm management as a field of study in the years before World War I.
Bailey made Warren a department head in 1907, a position he held until his untimely death in 1938, and the book traces his growth as a leader in Cornell’s College of Agriculture as it was growing in size and importance. He and his former student, Frank A. Pearson, created Farm Economics in 1923 and became leaders in farm price analysis in the 1920s and 1930s as the agricultural depression of the 1920s became a harbinger of the Great Depression of the early 1930s. Warren was nationally known as a strong, vocal advocate of going off the gold standard and moving toward a federally managed currency, which FDR implemented in 1933–34 as an important step in moving the U.S. out of the Depression. Warren was also a national and international figure in the founding of what today are the Agricultural and Applied Economics Association (AAEA) and the International Association of Agricultural Economists (IAAE), the major professional societies of agricultural economics. As a result of Warren’s many accomplishments and citizenship, FDR funded the construction of Warren Hall in 1932, the then department’s home on Cornell’s Ag Quad. Warren died quietly of liver cancer in 1938, a much-admired figure throughout rural America. 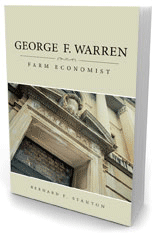 You may download a PDF copy of the book, George F. Warren: Farm Economist. Questions? Please contact us by email or by phone at 607.255.4576.